Throughout Enova’s 1oth Anniversary Year, Shedding Light is connecting with surgeons and physicians who were featured over the past three years in the online newsletter. This month we caught up with Dr. David M. Larson, an emergency physician who is Medical Director of the Ridgeview Emergency Departments at the Ridgeview Medical Center in Waconia and at Two Twelve Medical Center in Chaska, both located in Minnesota. 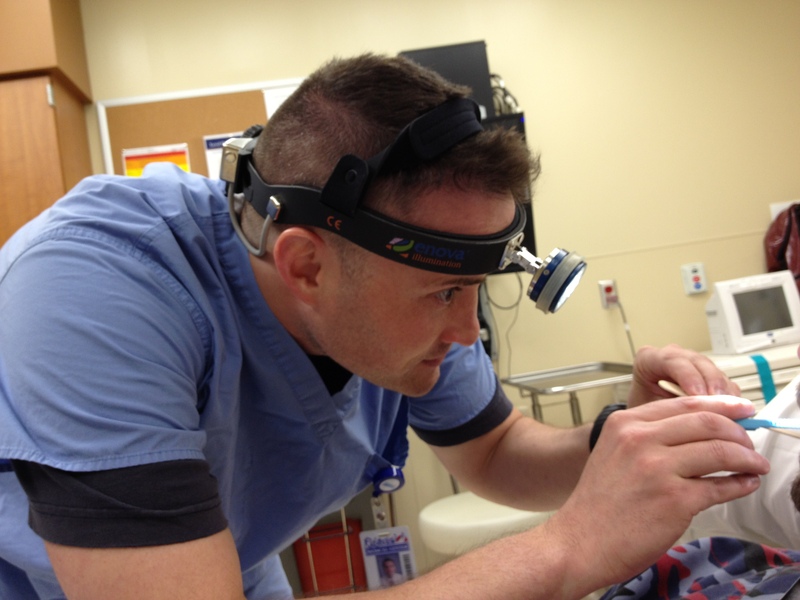 Dr. Larson was one of the first users of Enova’s first headlight, the Halo 5000 when it came out in 2005. At the time he was featured in Shedding Light, he and his staff were using Enova’s Iris S-100 surgical headlight in addition to the Halo 5000. While the Halo still functions, Dr. Larson chose to upgrade to one of Enova’s newest headlights, the Cyclops XLT-125 to supplement the S-100 in the emergency room. We asked him a few questions and included the original article published in June 2013. Shedding Light: Does your Halo 5000 still work? Dr. Larson: It works, but it’s not as comfortable or as easy to use as the newer XLT-125. We’d used the Halo headlight for 10 years, which is pretty remarkable. Shedding Light: How do you like the Cyclops XLT-125? Dr. Larson: It is very lightweight–unlike the Halo headlight, which has the batteries on the headlight band–and the batteries are easily slipped onto a waistband or into a scrubs pocket. The illumination is exceptional and brighter than any of our previous Enova headlights. And, it is absolutely better than a fiber optic headlight. It allows us to move around a patient with no cords. Shedding Light: What do you use the XLT-125 for in the emergency room? Dr. Larson: It is great for ENT procedures and surgical procedures. I especially like how the XLT-125, once the lamp is set to my preferred height on my head and at the perfect coaxial position, it follows my line of site but keeps the beam of light out a a patient’s eyes. It is very focused. I especially like how the XLT-125, once the lamp is set to my preferred height on my head and at the perfect coaxial position, it follows my line of site but keeps the beam of light out a a patient’s eyes. It is very focused. 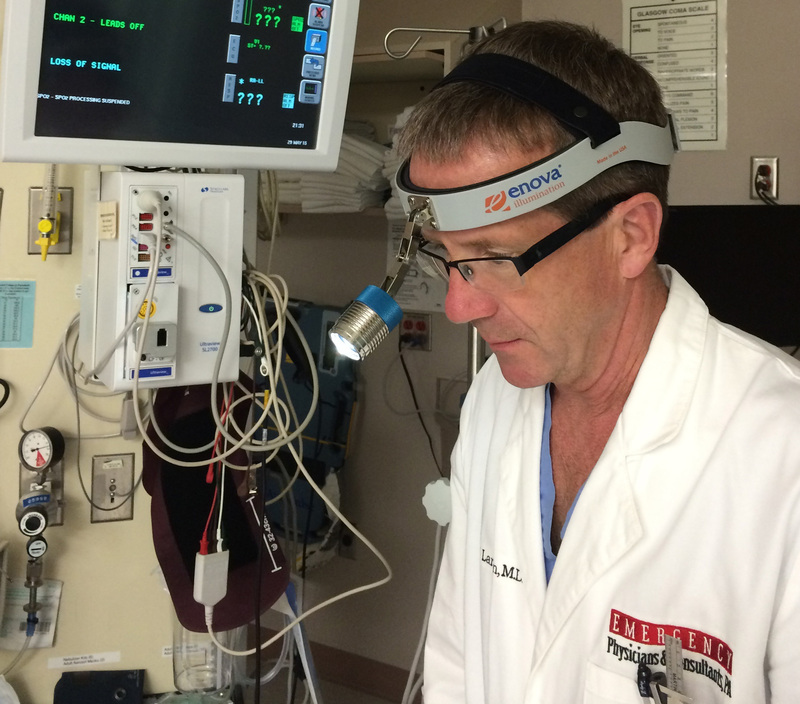 In June 2013, Shedding Light talked with Dr. Larson about the demands of emergency care, his mission work, and how Enova surgical headlights help him on the job and in the field. Here is that published interview.